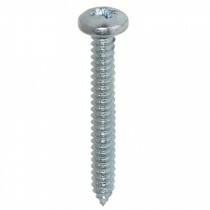 Pan pozi self tapping screw, type AB point, mild steel bright zinc plated. DIN 7981. Self tapping screws advance into the material when turned, while creating its own thread. They are commonly used within sheet metal and plastic components.